Embattled EPA Administrator Scott Pruitt has a low approval rating, but substantial swaths of the public don't have a strong opinion about Pruitt or know much about the ethics controversies surrounding him, according to a HarrisX Overnight Poll commissioned by Axios. Yes, but: The poll also finds that 80% of Americans believe Pruitt should be fired if EPA's inspector general finds that he misused his position — even if President Trump thinks he's doing a good job. That signals that even some of Trump's backers will not stand by Pruitt if the ongoing investigations find there's fire to go along with the all the smoke at EPA. The big picture: The poll suggests that Pruitt is not a hugely well-known or resonant figure outside the Beltway, despite generating weeks of negative press and waging an aggressive campaign to unwind environmental rules. The EPA boss is facing a suite of Capitol Hill and internal probes over his spending and travel expenses, hiring practices, ties to lobbyists and more. Pruitt is viewed favorably by 17% and unfavorably by 22%. But 30% hold neither view, and 32% have never heard of him. Just 21% approve of the job he's doing at EPA, 25% disapprove, but over half the people surveyed held neither view. Methodology: The online survey of 2,000 U.S. adults age 18 and over was conducted May 4–5, 2018. The results reflect a nationally representative sample. Results were weighted for age within gender, region, race/ethnicity, income, and wireless carrier where necessary to align them with their actual proportions in the population. Axios' Steve LeVine reports ... American and Chinese consumers are head over heels for SUVs — a mutual love affair that seems likely to expand in the coming years into growing demand for electric SUVs, according to a new report. Quick take: By 2022, Chinese demand for electric cars will triple, and the largest block — 39% — will be SUVs and crossovers, according to Bloomberg New Energy Finance. Americans will buy more than twice as many electrics as they currently do, and 52% of them will be SUVs and crossovers. Why it matters: Electric car skeptics cite relatively low current demand as evidence that battery-propelled vehicles are unlikely to break out of their niche any time soon. But the new forecast suggests why they can — because they will fall neatly into the current of existing mobility fashion. SUVs lead vehicle sales, accounting for 42% of all U.S. demand last year and 39% of China's. The report forecasts an overall boom in EV demand through 2040, led by a surge in the number of electric models on offer, especially from the German automakers but also Tesla, said Salim Morsy, the report's main author. SUVs will be the main driver of that demand, Morsy tells Axios. Go deeper: Read Steve's full story here and my earlier look at BNEF's electric bus forecast here. The Senate Environment and Public Works Committee passed bipartisan legislation Tuesday that would support the technology’s buildout, partly through ensuring coordination among federal agencies to develop pipelines to move captured carbon emissions. It acknowledges the concern among some companies, including ExxonMobil and Denbury Resources, about how to monitor captured carbon after using it to extract oil. A new coalition of those companies and several others are lobbying to remove monitoring requirements under current rules, citing property rights and other potential problems. Education (often Washington speak for advocacy/lobbying) around the need for the technology. The group intends to eventually be more public-facing. Supporting R&D at DOE and elsewhere. Supporting infrastructure for moving captured carbon around. Exploring the potential of storing captured carbon emissions offshore. Just released: the International Energy Agency has updated its wide-ranging Tracking Clean Energy Progress report, which takes stock of progress in deployment of low-carbon tech in power, transportation, buildings and more. Why it matters: It warns that despite gains, the advancement is not consistent with a global emissions pathway that would hold the global temperature rise below 2°C climate and meet other sustainable development goals around energy access and air pollution. The bottom line: "Only 4 out of 38 clean-energy technologies are on track to meet long-term sustainability goals," IEA said in a statement alongside release of the updated report. Bright spots: "Some technologies made tremendous progress in 2017, with solar PV seeing record deployment, LEDs quickly becoming the dominant source of lighting in the residential sector, and electric vehicle sales jumping by 54%," IEA said. Happening today, part 1: NASA Administrator Jim Bridenstine will testify before the Senate Appropriations subcommittee that crafts his agency's budget. Why it matters: Bridenstine made news last week by moving much closer to embracing the scientific consensus on human-induced global warming. But at least one Democrat will press Bridenstine for more specifics. Sen. Brian Schatz is highly outspoken on climate and plans to raise the topic with him, an aide said. Happening today, part 2: Senate Democrats including Minority Leader Chuck Schumer will gather next to a Capitol Hill Exxon station and argue that Trump's "reckless agenda thus far" has led to rising prices that are hurting working families. Why it matters: Democrats plan to use rising pump prices — which are nearing $3 per gallon — as a political weapon against Republicans. Reality check: the decision to abandon the Iran deal is putting upward pressure on the price of oil. But while gas station press conferences are a longtime Capitol Hill ritual, U.S. presidents have little sway over gasoline prices, which are largely tethered to crude prices influenced by a suite of forces. EPA controversy: Per The New York Times, yesterday EPA "barred reporters from three news organizations from an event on the impact of toxic chemicals on drinking water at the agency’s headquarters." Not cool: AP reports that guards prevented one of their reporters from passing through a security station, and when she asked to speak to public affairs, guards "shoved her forcibly" from the building. OPEC next output moves: Via Reuters, "OPEC may decide to raise oil output as soon as June due to worries over Iranian and Venezuelan supply and after Washington raised concerns the oil rally was going too far." Their piece cites OPEC and industry sources familiar with the discussions. Warning: Per CNBC, "Oil prices have broken out of a 'sweet spot' for global economic growth and could herald a U.S. recession if they keep rising, UBS warns." Shell's climate posture: From MarketWatch, "Royal Dutch Shell PLC...shareholders voted down Tuesday a proposal requiring the company align its strategy with efforts to limit global warming, signaling support for steps the company has already taken on climate change." Shell's latest: Per Reuters, "German solar battery maker sonnen has secured 60 million euros ($71 million) in funds from Shell Ventures and existing shareholders to expand at home and abroad." The two companies' announcement today says they have launched a "strategic cooperation" agreement. "This partnership will include innovative integrated energy propositions, enhanced EV charging solutions and the provision of grid services that are based on sonnen's virtual battery pool," it states. BP's new battery funding: Per S&P Global Platts, "BP Ventures has invested $20 million in StoreDot, an Israeli technology company developing an electric vehicle battery with a range of 300 miles and that can charge in five minutes." The big picture: The moves are part of the wider trend of European-based oil-and-gas giants increasingly making investments in the low-carbon power and electric vehicle tech space. Go deeper: I wrote about StoreDot's tech and their other funders here. The chart above comes from this short Energy Information Administration report on electric vehicle deployment and ownership. 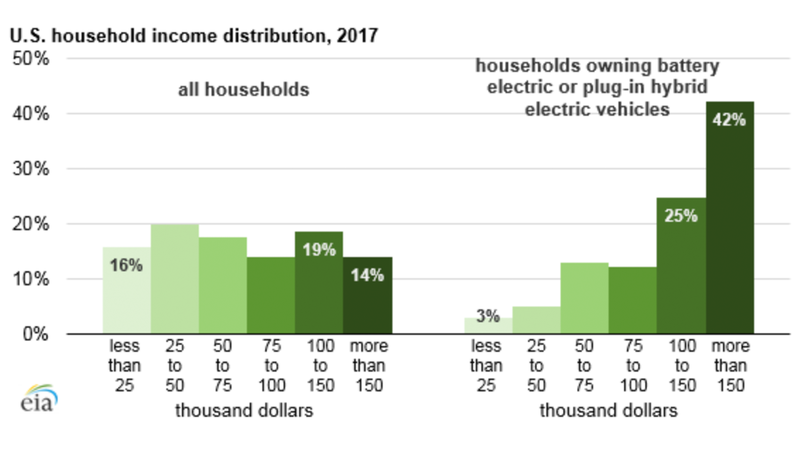 Why it matters: It shows that right now, ownership of electrics is fairly heavily concentrated in households well above the median income. Something to watch: The chart comes as analysts are waiting to see when exactly Tesla will offer a version of its Model 3 at the $35,000 base price — right now what's available is far more expensive.